American bison gallop over open ground in a golden haze. A curving line of horse-drawn wagons kick up dust in an Oklahoma land rush at Cherokee Outlet. At a glance the two scenes look alike, with the movement of large animals, the land stretching away for miles and the almost smokey light in the air. But the stories behind them come from far ends of a wide range. “On September 16, more than 100,000 settlers … participated in the largest-ever government-sponsored land run — 6,361,000 acres,” said the caption of the National Geographic photograph by Thomas Croft and P.A. Miller. 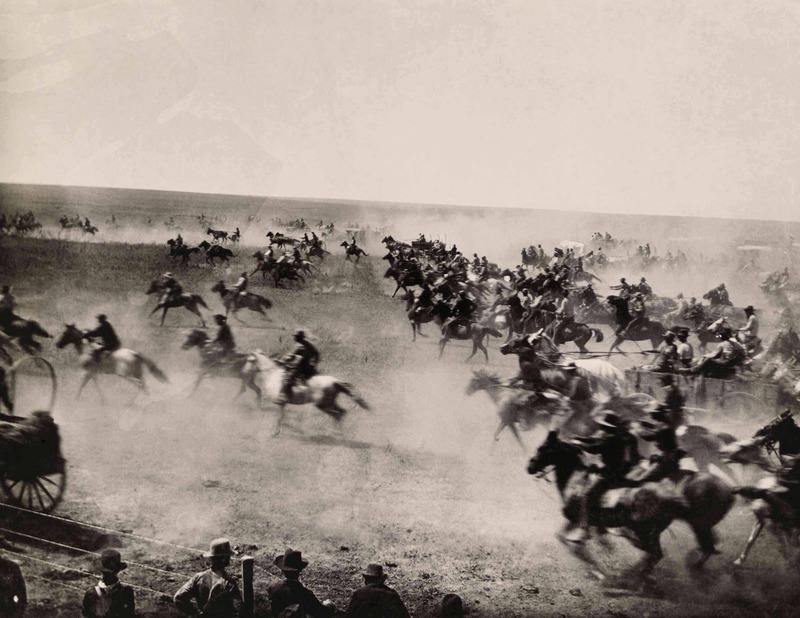 A land rush was a literal race to claim land, said Maria Mingalone, director of curatorial affairs and collections at the Berkshire Museum in Pittsfield, Mass. At the sound of a starting gun, settlers streamed into what would become a new state, and the first comers could stake out 160-acre lots. But they were not claiming uninhabited wilderness. People of the Creek, Seminole, Cherokee, Cheyenne, Chickasaw, Arapaho and other nations lived there. Riders race through the Cherokee Strip. Cherokee Outlet, Oklahoma, undated. Photo by Tulsa Chamber of Commerce, National Geographic Stock. Part of the exhibition National Geographic Greatest Photographs of the American West. Jim Brandenburg photographed the bison in South Dakota in 1950. Where an estimated 60 million bison once lived, 500,000 live today, said the text beside the photograph, and only 4 percent of those are wild. Both photographs appear in the National Geographic Society’s traveling show, “American West” at the Berkshire Museum, bringing together work from more than 50 photographers across more than 120 years. The images are beautiful, funny and probing, sometimes all at once. With the Berkshire Museum’s companion show, “Go West,” they celebrate the landscapes, the people and the history of the region from the prairie to the Pacific, and they challenge myths and misperceptions about it that still go on. In a long exposure, stars circle the night sky above kiva Casa Rinconada, an Anasazi observatory in Chaco Canyon. 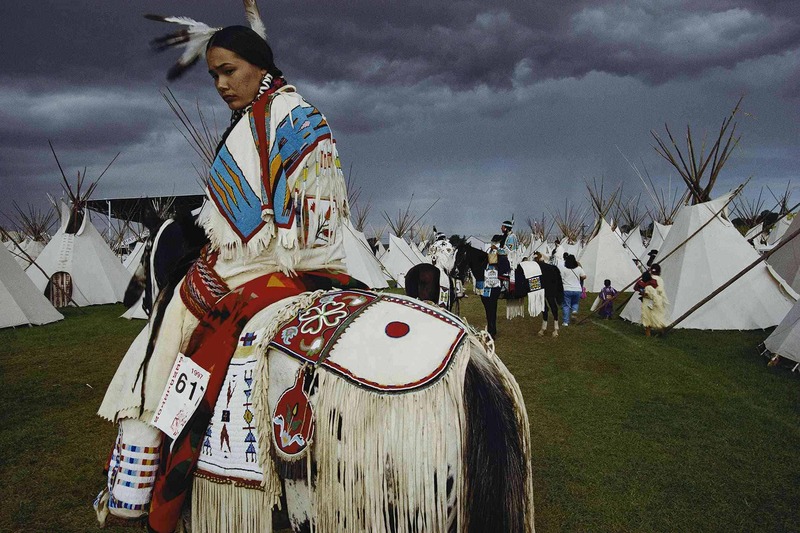 Across the room, Acosia Red Elk, winner of an American Indian Beauty Pageant in 1997, sits casually on a horse before a parade at the Pendleton Round-up in Oregon. In one of the oldest images, loggers in California stand beside a felled 1,341-year-old sequoia. In Texas a cowgirl ground-ties her pony by an El Paso parking meter. At the Pendleton Round-Up in Oregon, Acosia Red Elk, American Indian Beauty Pageant winner, waits for a parade in 1997. Photo by William Albert Allard/ National Geographic . Part of ‘Greatest Photographs of the American West’. To round out the photographs, Berkshire Museum exhibitions manager Jason Verchot has curated a companion show, “Go West,” inviting a close look at real life in the West and the vision of it that Hollywood, television and fashion have made popular. “We think of the cowboy as an iconic figure,” Mingalone said. In fact, the era of riders on the open range lasted only a short time, she said, from the 1860s to the 1890s. After the Civil War, a growing market for beef led to cattle drives, bringing free-range steers from Texas to Kansas, where the railway lines ran, to send meat to markets in the East. Those drives took time and hard work, she said, and at the end the cow hands would hold informal and rowdy competitions that later evolved into the professional rodeos of today. Early rodeos included boxing along with the roping, bronco riding and barrel racing, and they started the tradition of giving belt buckles as prizes. She showed a display of trophy buckles from women’s competitions. But cowboys on the trail rarely wore belts. Most of the time, these outdoor men and women wore tough and simple clothing, she said. Cowboys wore working clothes: suspenders and derby or bowler hats, or the hats they had worn in other professions in the East or to the South, top hats and sombreros. As cow hands wore their hats, slept on them, dented the tops and bent the rims, they began to look like the “cowboy hats” that people now imagine. In fact, most of the common images of what cowboys wore and what they did come from films, fashion and celebrities. Nudie Cohn, a Ukrainian-Born tailor in New York, gets credit for sleek suits with rhinestones and embroidery, Mingalone said. He became a costumer for stars like John Wayne, Gene Autry and Elton John. And Marge Riley’s cowgirl fashion shop in Los Angeles in the 1940s introduced fringe and leggings. “Fiction led fashion,” Mingalone said. Rodeo riders and performers have adopted Western styles, she said. Ranchers lived an active, outdoor life, and they still do. For a more practical perspective, visitors to the show can sit on a roping saddle, peer through glass at a live gila monster and examine the skeleton of a bison. They can take a photo in a covered wagon and imagine the challenges of surviving a prairie winter, or take in the earthy humor of cowgirl poet Georgie Sicking and short clips from “Cowgirls are Forever,” a documentary in progress by Berkshire film-maker Barbara Newman. The youngest woman in Newman’s film, working on her family’s ranch and looking after the horses in all weathers, explains how much she loves that life — caring for the animals and the place and feeling useful. This story first ran in the Arts & Entertainment section of the Berkshire Eagle on Oct. 23, 2015. Many thanks for A&E editor Jeffrey Borak. In the feature photo at the top, a starry night gleams above Owachomo Bridge at Natural Bridges National Monument, Utah, 2008. Photo by Jim Richardson/ National Geographic Stock. Part of the exhibition National Geographic Greatest Photographs of the American West. Thank you. I thought of you both often as I walked through the exhibit — I thought of all you have told me about the American Indian nations of the plains, and restoration of the prairie, and the different ways bison and cattle graze … and all dad has told me about the Civil War decimating farming in the East so that the Texas longhorns became one of the largest sources of beef in the country … and the Comanche becoming the best light cavalry in the world until illness and the repeating rifle took their toll, and the doctors who tried to bring small pox vaccines to the plains. I think you would both find these photographs powerful too.